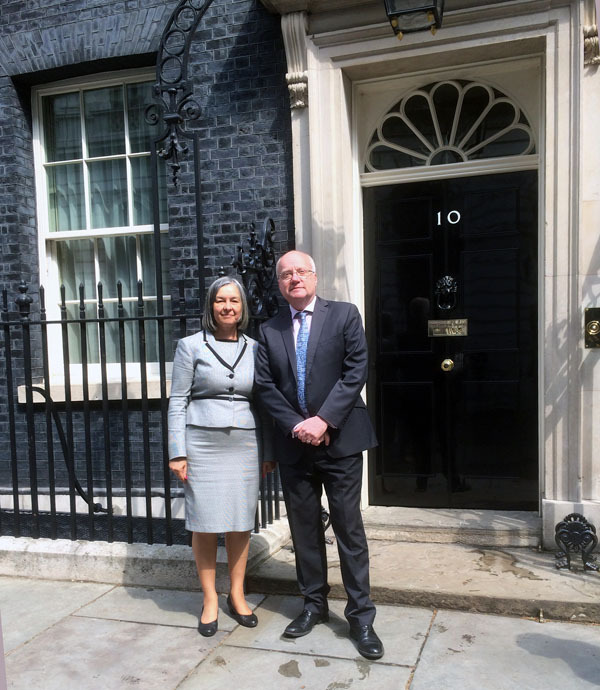 On May 24th UKOTA (UK Overseas Territories Association) met with Sir John Randall, the Prime Minister’s Special Adviser for the Environment. The meeting at 10 Downing Street was initiated by Kedell Worboys in her role as chair of UKOTA's Environment Sub-Committee. The discussion centred on Brexit implications, climate change and the Blue Belt agenda. I led-off the Blue Belt discussion, stressing that Tristan da Cunha is fiercely proud of the sustainability of its fishery. I emphasised that sound science and local 'ownership' were essential if the process is to be successful. In the margins, I was also able to update Sir John about the landslides on Tristan resulting from extreme rainfall events, and the geological work we hope will follow. Sir John was very open to the Territories' concerns, and has promised to keep in touch. outside No 10 Downing Street prior to the UKOTA Environment Meeting.